Perfect for weddings, bridal showers, engagement parties, birthday bouquets, baby showers, Valentine's Day, Mother's Day, and more! * Red, White, and Baby Pink heart shaped balloons. Inflate with helium or air to 15". 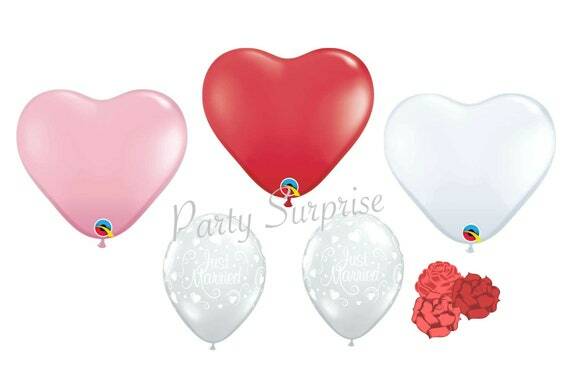 * Diamond Clear with hearts latex, inflate with helium or air to 11". * 66" white curling ribbon. Select your quantity from the DROP DOWNS in the ORDER box. Then select your colors from the other drop down. Ordering other items? Shipping will be combined and discounted when shipping to the same address.